SAN DIEGO (July 20, 2013) — Steampunk fans, rejoice. 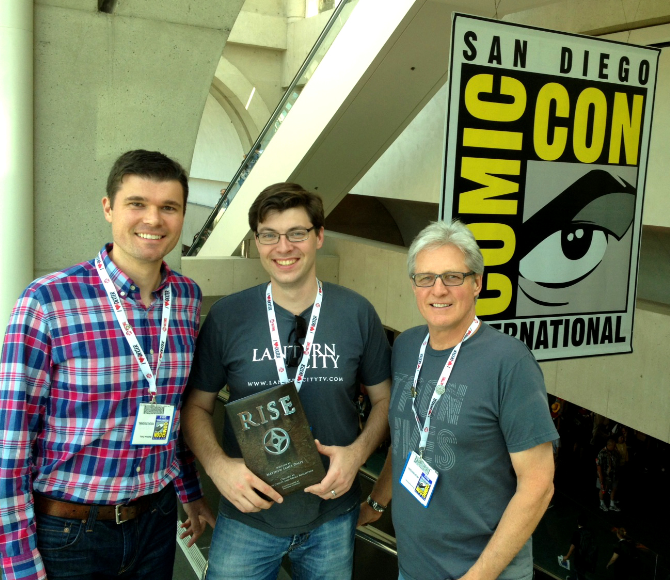 Executive producers Bruce Boxleitner and Trevor Crafts, and writer Matthew James Daley are bringing your genre back with a bang via the upcoming television series “Lantern City,” with a pilot projected for release in 2014. In an interview with Science Fiction Show executive producer and co-host Michael J. Wistock July 20, Boxleitner said their kind steampunk is one you’ll like. “Steampunk is such a diverse genre,” Boxleitner said. “This is going to be our version of it. We’re going to be true to ‘true steampunk,’ but I think there are many different interpretations. I don’t think there’s just one. “Rise” takes place “about a hundred years before” the television show starts, Boxleitner said. “Rise” chronicles Lantern City ruler Killian Grey’s great grandfather, Isaac, and shows early glimpses of young Killian. Wistock asked Daley if the experience will be richer by reading “Rise” before diving into the “Lantern City” television series. “Reading it will certainly enhance your viewing but it’s not necessary. They are two different entities,” Daley said. “The interesting thing as we’ve been working on the backstory and building on all of the ‘before the television show’ is that the viewers and the people who’ve been reading the book may know more than the people actually involved with the television show,” Crafts said. Of the choice of a steampunk setting, Crafts was clear. “We’ve been everywhere in television. It’s very hard to find a new, unique place to show viewers. We’ve been everywhere in outer space. Every cop show you can think of. Post-Apocalyptic Earth — that’s the new bit. We’re trying to find a new place that people haven’t seen yet. Crafts said two more prequel books are planned that lead up to the show. A Kindle edition of “Rise” and apps for iOS and Android are also on the way. The full interview is available here, from The Science Fiction Show at www.myscifishow.com or on iTunes.